DIE Veneris, videlicet, 17 die Junii. Letter from L. Dacres, that he is now ill, but will attend in a Fortnight. Capt. Brough, about Reports against the L. Lieutenant of Ireland. Clauses in the King's Declaration in Answer to one of both Houses. Message to the H. C. for a Conference to prepare an Answer to it. E. of Exeter to put the Rutland Militia in Execution. E. Bolingbrooke, about raising Money and Horse. Committee to take an Account of Money, Horses, &c. brought into the City. Letters to L. Dacres and E. of Exeter. Message from the H. C. to pass the Ordinance for the additional Forces in Ireland. To know the King's Pleasure about passing Two Bills. Deputy Lieutenants for Essex. For the Devonshire Militia to be put in Execution. Letter to be sent to Secretary Nicholas, about passing Bills. Message from the H. C with a Resolution for putting in Execution the Propositions for raising Horse. E. of Stamford opposed in putting in Execution the Leicestershire Militia. by the E. of Devon, &c. who have Commissions of Array. Committee to consider how to prevent the executing the Commissions of Array. Message from the H. C. for the Commissioners for Irish Affairs to meet. Message from the H. C. for melting down the Plate brought in by virtue of the Propositions. Message to the H. C. for Committees to consider of a proper Place to put the Ammunition &c. in from Hull. Ordinance for the Sea Adventurers. 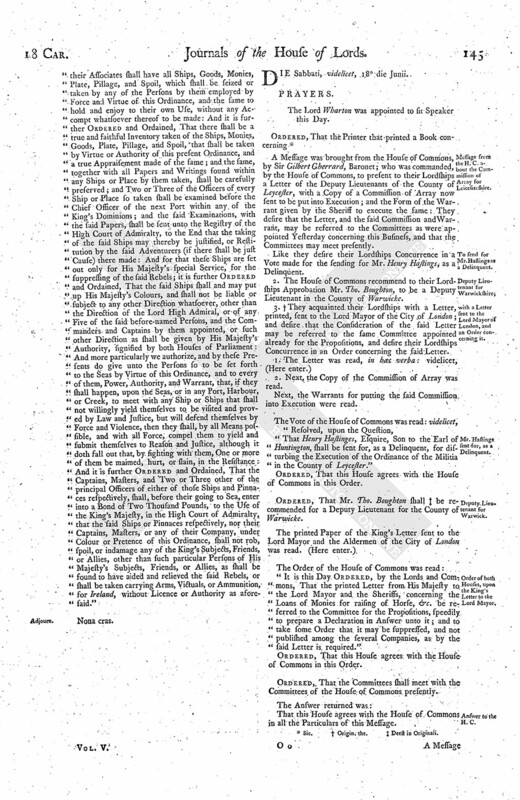 Petition of Captains &c. of the County of Essex. Lords Answer to the Petition. The Speaker's Letter to L. Dacres, for the Execution of the Militia. The Speaker's Letter to the E. of Exeter, to put the Militia in Execution. E. of Exeter, to put the Militia in Execution in Rutlandshire. The Ordinance for the Sea Adventure to Ireland. A Letter was read, from the Lord Dacres, who expressed "a great Desire to attend this House; but, because his Health is not good at this Time to come in Person, and do his Service to this House, but hopes within a Fortnight to come in Person." Hereupon it is Ordered, That the Speaker write him a Letter from this House, to give (fn. 1) his Lordship Thanks for his Expressions of his Service to this House, and to desire him within a Fortnight to come to this House. The Lord Admiral reported, "That the Committee hath examined the Parties and Witnesses in the Lord Lieutenant's Cause, concerning the Reports of his Lordship's having taken Money for Officers Places: That it hath been proved that Captain Brough spake Words to this Effect; and he said he had the Ground from Captain Manwood, who denies the Words: And the Opinion of the Committee was, That it was fit to be examined by this House, to clear the Honour of a great Person." Which this House Ordered the same accordingly. Ordered, To have a Conference with the House of Commons, concerning this Business; and that a Committee of both Houses may be appointed, to draw a Declaration, by Way of an Answer to this Particular; and that Care be taken to disperse it throughout the Kingdom. To desire a present Conference, concerning an Answer to a Declaration of both Houses, late set out by both Houses of Parliament. L. Viscount Say & Seale. L. Robartes. The Petitioners withdrew, and the House [ (fn. 2) took it] into Consideration; and it was appointed, That the Lord Admiral, Earl Holland, Lord Viscount Say & Seale, and Lord Robarts, should presently draw up what Answer for the present shall be given to the said Petition. Concerning the Arms which they desire may be restored, this House Resolved, To have a Conference with the House of Commons about them. Ordered, That the Earl of Bollingbrooke shall put into Execution the Propositions concerning the raising of Horse, Money, and Plate. 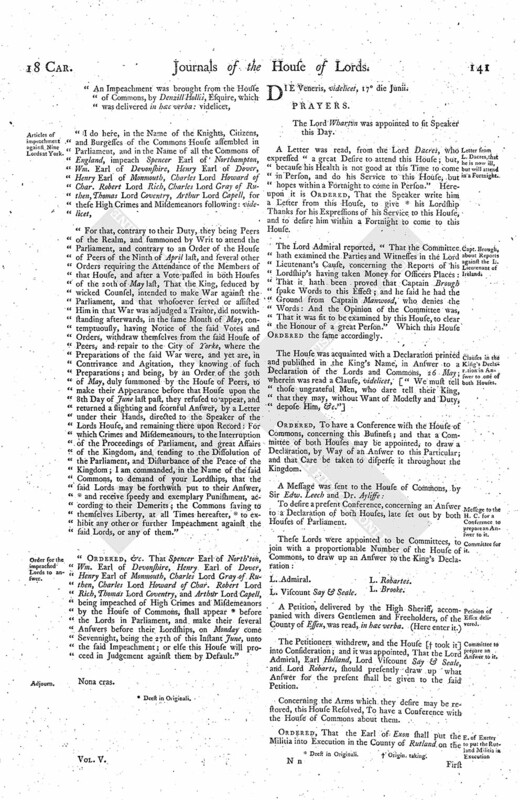 Ordered, That the Lord Wharton and the Lord Brooke are appointed Committees, with a proportionable Number of the House of Commons, to go into the City as oft as they shall think fit, to take an Account what Money, Plate, and Horses, are brought in, and to consider of what Course is to be taken for the Expedition and Advancement of this necessary Service in the City; and the Receivers and Commissaries are appointed to bring in Lists unto the said Committees, of all those that have subscribed, or shall from Time to Time subscribe. That the House of Commons will give a Meeting presently, in the Painted Chamber, as is desired. The Earl of Essex was appointed to deliver the Sense of this House concerning this Conference. Two Letters were read, and approved of. 1. To be sent to the Lord Dacres. 2. To be sent to the Earl of Exon. Both to be signed by the Speaker. 1. To desire that the Ordinance concerning the Ships that (fn. 3) are to go for Ireland as additional Forces may be presently passed. 2. To desire their Lordships to take some Course, to know the King's Pleasure concerning the passing of the Bill for the Assembly, and the Bill for the Subscription concerning the Adventure for Ireland. 3. That Mr. Tymothy Midleton may be One of the Deputy Lieutenants for the County of Essex. 4. To desire that their Lordships would please to appoint that the Militia shall be put into Execution in the County of Devon, on the First of July next. Ordered, That this House will take the Ordinance for the additional Forces into speedy Consideration; and concerning the King's Answer touching the passing of the Two Bills, a Letter from the Speaker is to be sent to Secretary Nicholas, to know the King's Pleasure therein. The Answer returned was as aforesaid. "That the Horsemen that shall come to the Commissaries to Guildhall, to be inrolled, shall deliver Tickets where they lie, that they may be ready to be trained upon Warning; and that, so soon as Sixty Horses shall be inrolled, Notice shall be given by the Commissaries to the Lord Admiral, the Earl of Essex, Earl of Pembrooke, Earl of Holland, and the Lord Viscount Say & Seale, Master of His Majesty's Court of Wards and Liveries, or some One of them; that, by the Direction of the greater Part of them; Officers may be appointed for the several Troops, to command, train, and exercise them; and that the Commissaries shall begin to sit at the Place appointed in the Propositions on Monday next." Resolved, upon the Question, That this House is of Opinion to join with the House of Commons in this Vote. That this House agrees with the House of Commons in this Vote. 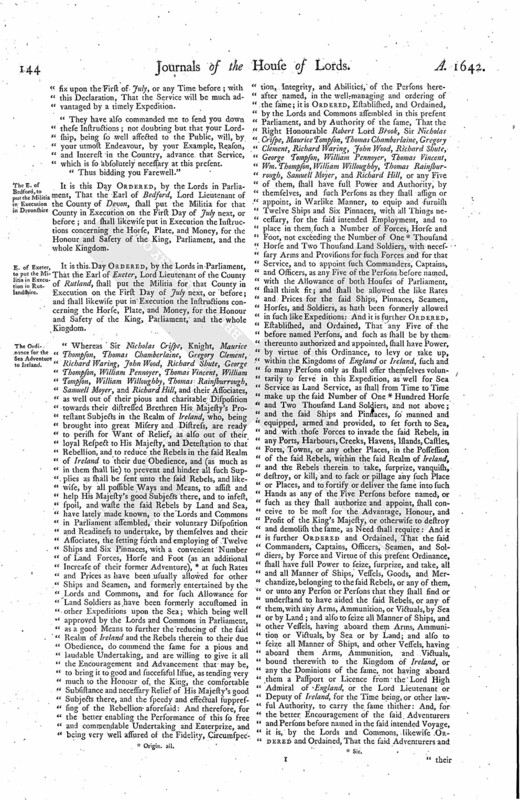 The Letter of the Earl of Stamford was read again; shewing, "That the County of Leycester have executed the Militia with a great Readiness, and many Voluntiers came in; but a Commission of Array is granted to the Earls of Huntingdon and Devon, and Mr. Henry Hasting, to oppose the Militia; and the said Commission is to be put into Execution on Thursday next: Therefore the Earl of Stamford desired the Advice of the Parliament, what he shall do if the said Commission be put into Execution." Hereupon it was Resolved, To have a select Committee of both Houses, to consider how to prevent the executing of Commissions of Array, and in particular that Commission of Array which the Earl of Stamford hath informed. To meet at Three of the Clock this Afternoon. 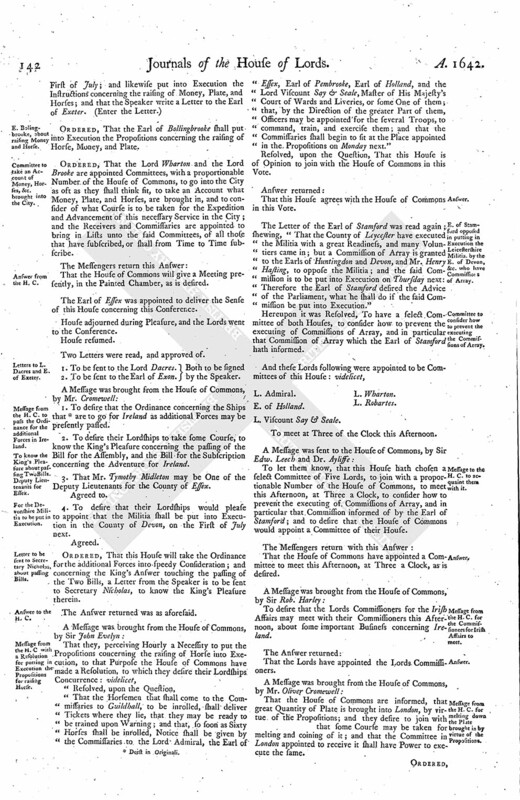 To let them know, that this House hath chosen select Committee of Five Lords, to join with a proportionable Number of the House of Commons, to meet this Afternoon, at Three a Clock, to consider how to prevent the executing of Commissions of Array, and in particular that Commission informed of by the Earl of Stamford; and to desire that the House of Commons would appoint a Committee of their House. That the House of Commons have appointed a Committee to meet this Afternoon, at Three a Clock, as is desired. To desire that the Lords Commissioners for the Irish Affairs may meet with their Commissioners this Afternoon, about some important Business concerning Ireland. That the Lords have appointed the Lords Commissioners. That the House of Commons are informed, that great Quantity of Plate is brought into London, by virtue of the Propositions; and they desire to join with that some Course may be taken for melting and coining of it; and that the Committee in London appointed to receive it shall have Power to execute the same. Ordered, That this House agrees with the House of Commons in this Desire. Ordered, That it is referred to the Committee appointed this Day to go into London, to take an Account of the Money, and Plate, and Horses, to consider of some fit Places to lay the Arms and Ammunition in, that came from Hull. To let them know, that the Lords appointed Two Lords, to join with a proportionable Number of the House of Commons, to go this Afternoon into London, to take an Account of what Money, Plate, and Horse, are come in, according to the Propositions: The Lords do desire that the said Committees shall have Power to consider of some fit Places in London, to lay the Arms and Ammunition in that came from Hull. Resolved, upon the Question, That this Ordinance shall pass. The Earl of Leycester, Lord Lieutenant of the Kingdom of Ireland. "To the Right Honourable the Lords and Commons assembled in the High Court of Parliament. 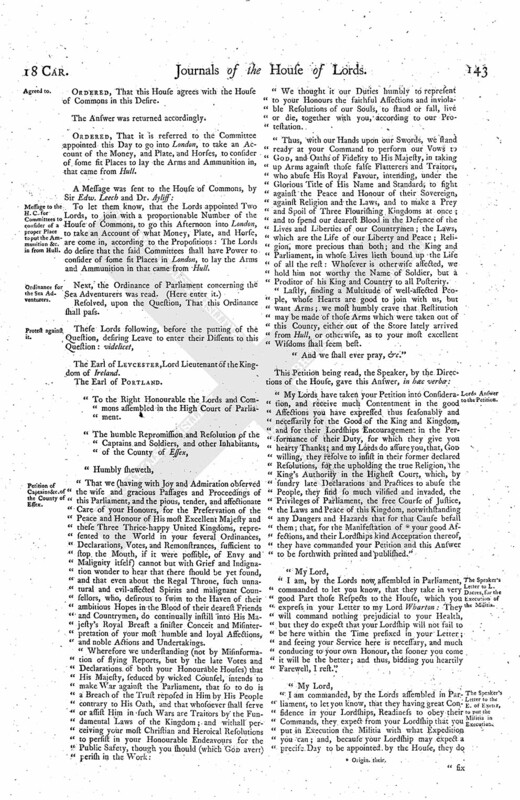 "That we (having with Joy and Admiration observed the wife and gracious Passages and Proceedings of this Parliament, and the pious, tender, and affectionate Care of your Honours, for the Preservation of the Peace and Honour of His most Excellent Majesty and these Three Thrice-happy United Kingdoms, represented to the World in your several Ordinances, Declarations, Votes, and Remonstrances, sufficient to stop the Mouth, if it were possible, of Envy and Malignity itself) cannot but with Grief and Indignation wonder to hear that there should be yet found, and that even about the Regal Throne, such unnatural and evil-affected Spirits and malignant Counsellors, who, desirous to swim to the Haven of their ambitious Hopes in the Blood of their dearest Friends and Countrymen, do continually instill into His Majesty's Royal Breast a sinister Conceit and Misinterpretation of your most humble and loyal Affections, and noble Actions and Undertakings. "We thought it our Duties humbly to represent to your Honours the faithful Affections and inviolable Resolutions of our Souls, to stand or fall, live or die, together with you, according to our Protestation. "Thus, with our Hands upon our Swords, we stand ready at your Command to perform our Vows to God, and Oaths of Fidelity to His Majesty, in taking up Arms against those false Flatterers and Traitors, who abuse His Royal Favour, intending, under the Glorious Title of His Name and Standard, to fight against the Peace and Honour of their Sovereign, against Religion and the Laws, and to make a Prey and Spoil of Three Flourishing Kingdoms at once; and to spend our dearest Blood in the Defence of the Lives and Liberties of our Countrymen; the Laws, which are the Life of our Liberty and Peace; Religion, more precious than both; and the King and Parliament, in whose Lives lieth bound up the Life of all the rest: Whosever is otherwise affected, we hold him not worthy the Name of Soldier, but a Proditor of his King and Country to all Posterity. "Lastly, finding a Multitude of well-affected People, whose Hearts are good to join with us, but want Arms; we most humbly crave that Restitution may be made of those Arms which were taken out of this County, either out of the Store lately arrived from Hull, or otherwise, as to your most excellent Wisdoms shall seem best. "My Lords have taken your Petition into Consideration, and receive much Contentment in the good Affections you have expressed thus seasonably and necessarily for the Good of the King and Kingdom, and for their Lordships Encouragement in the Performance of their Duty, for which they give you hearty Thanks; and my Lords do assure you, that, God willing, they resolve to insist in their former declared Resolutions, for the upholding the true Religion, the King's Authority in the Highest Court, which, by sundry late Declarations and Practices to abuse the People, they find so much vilified and invaded, the Privileges of Parliament, the free Course of Justice, the Laws and Peace of this Kingdom, notwithstanding any Dangers and Hazards that for that Cause befall them; that, for the Manifestation of (fn. 4) your good Affections, and their Lordships kind Acceptation thereof, they have commanded your Petition and this Answer to be forthwith printed and published." "I am, by the Lords now assembled in Parliament, commanded to let you know, that they take in very good Part those Respects to the House, which you express in your Letter to my Lord Wharton: They will command nothing prejudicial to your Health, but they do expect that your Lordship will not fail to be here within the Time prefixed in your Letter; and seeing your Service here is necessary, and much conducing to your own Honour, the sooner you come it will be the better; and thus, bidding you heartily Farewell, I rest." "I am commanded, by the Lords assembled in Parliament, to let you know, that they having great Considence in your Lordships, Readiness to obey their Commands, they expect from your Lordship that you put in Execution the Militia with what Expedition you can; and, because your Lordship may expect a precise Day to be appointed by the House, they do fix upon the First of July, or any Time before; with this Declaration, That the Service will be much advantaged by a timely Expedition. "They have also commanded me to send you down these Instructions; not doubting but that your Lordship, being so well affected to the Public, will, by your utmost Endeavour, by your Example, Reason, and Interest in the Country, advance that Service, which is so absolutely necessary at this present. It is this Day Ordered, by the Lords in Parliament, That the Earl of Bedford, Lord Lieutenant of the County of Devon, shall put the Militia for that County in Execution on the First Day of July next, or before; and shall likewife put in Execution the Instructions concerning the Horse, Plate, and Money, for the Honour and Safety of the King, Parliament, and the whole Kingdom. It is this Day Ordered, by the Lords in Parliament, That the Earl of Exeter, Lord Lieutenant of the County of Rutland, shall put the Militia for that County in Execution on the First Day of July next, or before; and shall likewise put in Execution the Instructions concerning the Horse, Plate, and Money, for the Honour and Safety of the King, Parliament, and the whole Kingdom. "Whereas Sir Nicholas Crispe, Knight, Maurice Thompson, Thomas Chamberlaine, Gregory Clement, Richard Waring, John Wood, Richard Shute, George Thompson, William Pennoyer, Thomas Vincent, William Tompson, William Willoughby, Thomas Rainsburrough, Samuell Moyer, and Richard Hill, and their Associates, as well out of their pious and charitable Disposition towards their distressed Brethren His Majesty's Protestant Subjects in the Realm of Ireland, who, being brought into great Misery and Distress, are ready to perish for Want of Relief, as also out of their loyal Respect to His Majesty, and Detestation to that Rebellion, and to reduce the Rebels in the said Realm of Ireland to their due Obedience, and (as much as in them shall lie) to prevent and hinder all such Supplies as shall be sent unto the said Rebels, and likewife, by all possible Ways and Means, to assist and help His Majesty's good Subjects there, and to infest, spoil, and waste the said Rebels by Land and Sea, have lately made known, to the Lords and Commons in Parliament assembled, their voluntary Disposition and Readiness to undertake, by themselves and their Associates, the setting forth and employing of Twelve Ships and Six Pinnaces, with a convenient Number of Land Forces, Horse and Foot (as an additional Increase of their former Adventure), (fn. 5) at such Rates and Prices as have been usually allowed for other Ships and Seamen, and formerly entertained by the Lords and Commons, and for such Allowance for Land Soldiers as have been formerly accustomed in other Expeditions upon the Sea; which being well approved by the Lords and Commons in Parliament, as a good Means to further the reducing of the said Realm of Ireland and the Rebels therein to their due Obedience, do commend the same for a pious and laudable Undertaking, and are willing to give it all the Encouragement and Advancement that may be, to bring it to good and successful Issue, as tending very much to the Honour of the King, the comfortable Subsistance and necessary Relief of His Majesty's good Subjects there, and the speedy and effectual suppressing of the Rebellion aforesaid: And therefore, for the better enabling the Performance of this so free and commendable Undertaking and Enterprize, and being very well assured of the Fidelity, Circumspection, Integrity, and Abilities, of the Persons hereafter named, in the well-managing and ordering of the same; it is Ordered, Established, and Ordained, by the Lords and Commons assembled in this present Parliament, and by Authority of the same, That the Right Honourable Robert Lord Brook, Sir Nicholas Crispe, Maurice Tompson, Thomas Chamberlaine, Gregory Clement, Richard Waring, John Wood, Richard Shute, George Tompson, William Pennoyer, Thomas Vincent, Wm. Thompson, William Willoughby, Thomas Rainsburrough, Samuell Moyer, and Richard Hill, or any Five of them, shall have full Power and Authority, by themselves, and such Persons as they shall assign or appoint, in Warlike Manner, to equip and furnish Twelve Ships and Six Pinnaces, with all Things necessary, for the said intended Employment, and to place in them such a Number of Forces, Horse and Foot, not exceeding the Number of One (fn. 6) Thousand Horse and Two Thousand Land Soldiers, with necessary Arms and Provisions for such Forces and for that Service, and to appoint such Commanders, Captains, and Officers, as any Five of the Persons before named, with the Allowance of both Houses of Parliament, shall think fit; and shall be allowed the like Rates and Prices for the said Ships, Pinnaces, Seamen, Horses, and Soldiers, as hath been formerly allowed in such like Expenditions: And it is further Ordered, Established, and Ordained, That any Five of the before named Persons, and such as shall be by them thereunto authorized and appointed, shall have Power, by virtue of this Ordinance, to levy or take up, within the Kingdoms of England or Ireland, such and so many Persons only as shall offer themselves voluntarily to serve in this Expedition, as well for Sea Service as Land Service, as shall from Time to Time make up the said Number of One (fn. 6) Hundred Horse and Two Thousand Land Soldiers, and not above; and the said Ships and Pinnaces, so manned and equipped, armed and provided, to set forth to Sea, and with those Forces to invade the said Rebels, in any Ports, Harbours, Creeks, Havens, Islands, Castles, Forts, Towns, or any other Places, in the Possession of the said Rebels, within the said Realm of Ireland, and the Rebels therein to take, surprize, vanquish, destroy, or kill, and to sack or pillage any such Place or Places, and to fortify or deliver the same into such Hands as any of the Five Persons before named, or such as they shall authorize and appoint, shall conceive to be most for the Advantage, Honour, and Profit of the King's Majesty, or otherwise to destroy and demolish the same, as Need shall require: And it is further Ordered and Ordained, That the said Commanders, Captains, Officers, Seamen, and Soldiers, by Force and Virtue of this present Ordinance, shall have full Power to seize, surprize, and take, all and all Manner of Ships, Vessels, Goods, and Merchandize, belonging to the said Rebels, or any of them, or unto any Person or Persons that they shall find or understand to have aided the said Rebels, or any of them, with any Arms, Ammunition, or Victuals, by Sea or by Land; and also to seize all Manner of Ships, and other Vessels, having aboard them Arms, Ammunition or Victuals, by Sea or by Land; and also to seize all Manner of Ships, and other Vessels, having aboard them Arms, Ammunition, and Victuals, bound therewith to the Kingdom of Ireland, or any the Dominions of the same, not having aboard them a Passport or Licence from the Lord High Admiral of England, or the Lord Lieutenant or Deputy of Ireland, for the Time being, or other lawful Authority, to carry the same thither: And, for the better Encouragement of the said Adventurers and Persons before named in the said intended Voyage, it is, by the Lords and Commons, likewise Ordered and Ordained, That the said Adventurers and their Associates shall have all Ships, Goods, Monies, Plate, Pillage, and Spoil, which shall be seized or taken by any of the Persons by them employed by Force and Virtue of this Ordinance, and the same to hold and enjoy to their own Use, without any Accompt whatsoever thereof to be made: And it is further Ordered and Ordained, That there shall be a true and faithful Inventory taken of the Ships, Monies, Goods, Plate, Pillage, and Spoil, that shall be taken by Virtue or Authority of this present Ordinance, and a true Appraisement made of the same; and the same, together with all Papers and Writings found within any Ships or Place by them taken, shall be carefully preserved; and Two or Three of the Officers of every Ship or Place so taken shall be examined before the Chief Officer of the next Port within any of the King's Dominions; and the said Examinations, with the said Papers, shall be sent unto the Registry of the High Court of Admiralty, to the End that the taking of the said Ships may thereby be justified, or Restitution by the said Adventurers (if there shall be just Cause) there made: And for that these Ships are set out only for His Majesty's special Service, for the suppressing of the said Rebels; it is further Ordered and Ordained, That the said Ships shall and may put up His Majesty's Colours, and shall not be liable or subject to any other Direction whatsoever, other than the Direction of the Lord High Admiral, or of any Five of the said before-named Persons, and the Commanders and Captains by them appointed, or such other Direction as shall be given by His Majesty's Authority, signified by both Houses of Parliament: And more particularly we authorize, and by these Presents do give unto the Persons so to be set forth to the Seas by Virtue of this Ordinance, and to every of them, Power, Authority, and Warrant, that, if they shall happen, upon the Seas, or in any Port, Harbour, or Creek, to meet with any Ship or Ships that shall not willingly yield themselves to be visited and proved by Law and Justice, but will defend themselves by Force and Violence, then they shall, by all Means possible, and with all Force, compel them to yield and submit themselves to Reason and Justice, although it doth fall out that, by fighting with them, One or more of them be maimed, hurt, or slain, in the Resistance: And it is further Ordered and Ordained, That the Captains, Masters, and Two or Three other of the principal Officers of either of those Ships and Pinnaces respectively, shall, before their going to Sea, enter into a Bond of Two Thousand Pounds, to the Use of the King's Majesty, in the High Court of Admiralty, that the said Ships or Pinnaces respectively, nor their Captains, Masters, or any of their Company, under Colour or Pretence of this Ordinance, shall not rob, spoil, or indamage any of the King's Subjects, Friends, or Allies, other than such particular Persons of His Majesty's Subjects, Friends, or Allies, as shall be found to have aided and relieved the said Rebels, or shall be taken carrying Arms, Victuals, or Ammunition, for Ireland, without Licence or Authority as aforesaid."